"Let him kiss me with the kisses of his mouth: for thy love is better than wine" (Song of Songs 1:2). A single solitaire diamond is set in the middle of this diamond cross heart pendant, as a reminder of God's love. Made in 14k solid gold. Pendant measures 1/3" x 1/3" (8.25mm x 8.25mm). Diamonds weigh a total of 0.01 carats in all in G-H Color, SI1 clarity. Gold weighs approx. 0.65 grams. 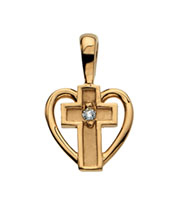 We guarantee our Small Diamond Heart Cross Pendant, 14K Gold to be high quality, authentic jewelry, as described above.